Welcome to Web Dynpro Java! Anyone who’s ever had to try and make sense of a large quantity of information will know that as soon as you try to force that information into some sort of list or sequence, you often loose more than you gain. The list might look neat and tidy, but you will not have an accurate representation of the inter-relationships between all the different facts. The bottom line here is that information cannot be represented entirely sequentially or hierarchically. In reality, one piece of information is related to multiple other pieces of information to form a web of relationships, associations and dependencies. A mind map is a simplified form of a diagram known as a Semantic Network. Mind maps have been used in many different forms for many centuries, but have lately been popularized by the British psychologist and educationalist Tony Buzan. A mind map allows you to create a web of relationships between words, ideas and tasks. In creating this network or web of relationships, you can communicate the structure of information in a way that is compact and easy to understand. Rather than having to use several sentences of text to describe the relationship between a set of ideas, you can simply place each idea on the page and draw lines between them. The lines can additionally be labelled in order to add further description to the relationship. Typically, a mind map will start from a central topic, and from this will spread out various related topics. When used correctly, this diagramming technique can concisely describe the relationship between multiple ideas and tasks yet require significantly fewer words than an equivalent plain text description would. In addition to this, the associations between the information in a mind map act as veru effective triggers to memory, and help you remember details about that particular topic that you thought you’d forgotten. This is why a mind map has been chosen to represent the ideas, facts and tasks involved in understanding Web Dynpro for Java. The screen shots are taken from the Mindjet® MindManager® Viewer 7 running as a stand alone program as opposed to a browser plug-in. To install the Mindjet MindManager Viewer as a stand alone program, please follow the link to the Mindjet website where the software is available for free download (25Mb download). The viewer software is available in four different languages (English, German, French and Japanese) for both PC and Mac systems. If you are using Internet Explorer version 6.0 or higher, then the plug-in will install automatically. Depending on the security settings of your browser, you may see a security warning message displayed. Click on "Yes" to install the ActiveX plug-in. 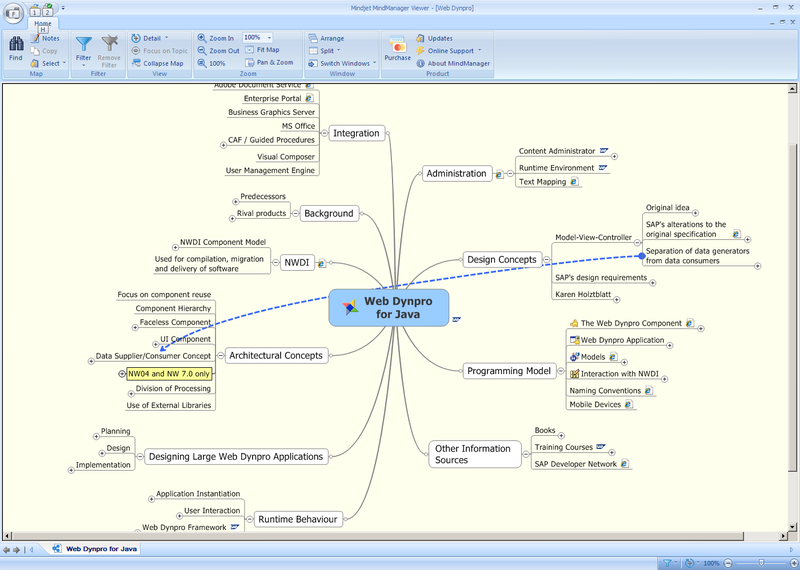 Follow this link to view the Web Dynpro for Java mind map using the browser plug-in. 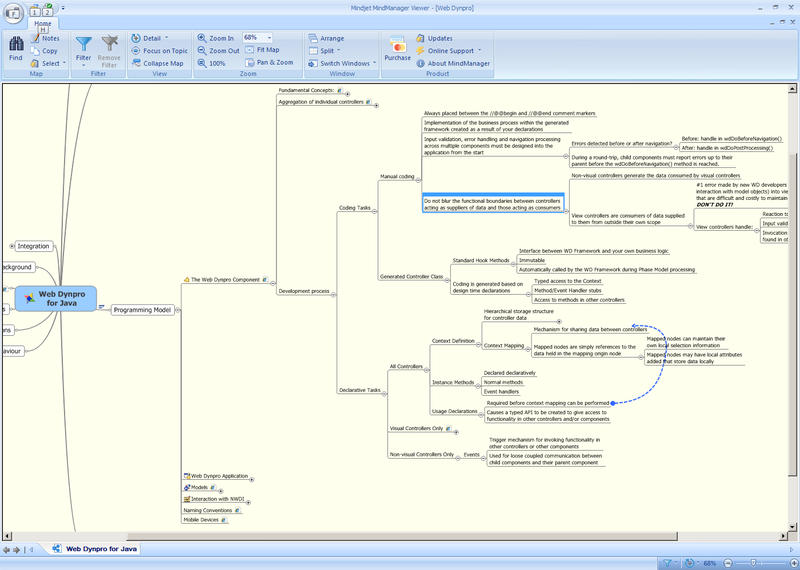 If you choose to install the stand alone Mindjet MindManager Viewer, then you need to have a local copy of the mind map file. 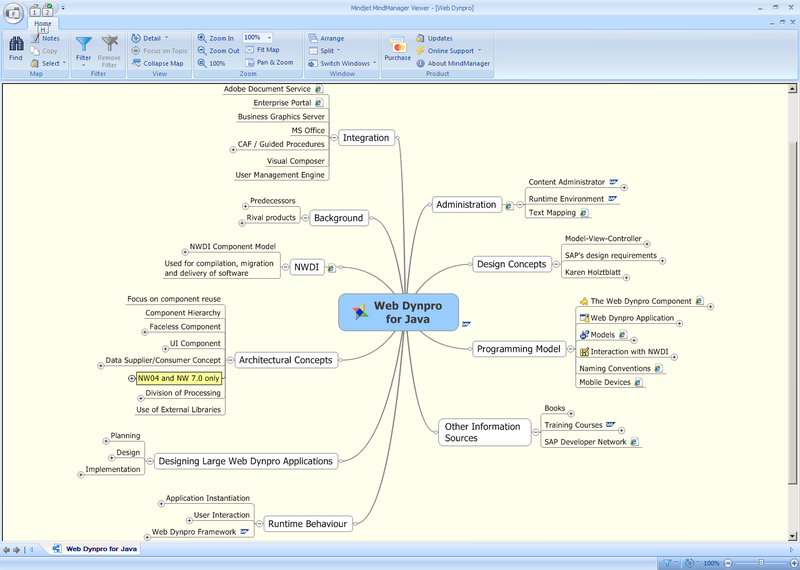 This is done by right-clicking on this link Web Dynpro mind map and select "Save Target As". It is possible that the browser will mistake the mind map file for a ZIP file, and then try to open it with some tool such as WinZIP or WinRAR. If this happens, you must make sure that the file extension is not changed to .zip. The mind map file must have an extension of .mmap and must not be unzipped. Once you have installed the Mindjet MindManager Viewer as either the stand alone program or the browser plug-in, you will then be able to view and navigate around the Web Dynpro mind map. As you can see from Figure 2, radiating out from the central subject are nine different topics. Each one of these topics is then broken down into further sub-topics. As these branches are expanded, further relationships will emerge between the different sup-topic areas. You will also notice from the diagram above that some of the links have icons to the right of the text. This indicates that a hypertext link is available to take you to a document, presentation or web page within either SDN, or the Online SAP Help or some other relevant information source. Figure 3: When the same concepts appear in multiple locations within the mind map, blue association arrows link them together. Since facts cannot be arranged sequentially without significant degradation of the information content, you will see the same concepts or topics appearing in multiple places across the map. When they do, you will see a blue association arrow that connects them together. See Figure 3 above. Once you have expanded several branches of the mind map, you will find that it rapidly becomes larger than the available screen size. In this situation, you can either change the zoom level (Ctrl + spin mouse wheel) or drag the whole map around to examine a particular area. Dragging the map can be done by first left-clicking and holding, and then the mouse pointer changes to a hand and you are then able to drag the whole map in any direction. Be careful about expanding too many branches of this map at once! This map can grow to become very large and you will not be able to see all the branches at once. It is recommended that you expand only the particular branch you are interested in. Figure 4: Since the mind map is very large, you should only expand the branches you are interested in. It is quite possible to print the fully expanded Web Dynpro mind map - as long as you have a printer with paper sufficiently large! For instance, the entire map can be printed successfully on an HP 1055CM printer. The resulting print is about 1 metre wide and 2.5 metres high. A word of warning about the print settings though! 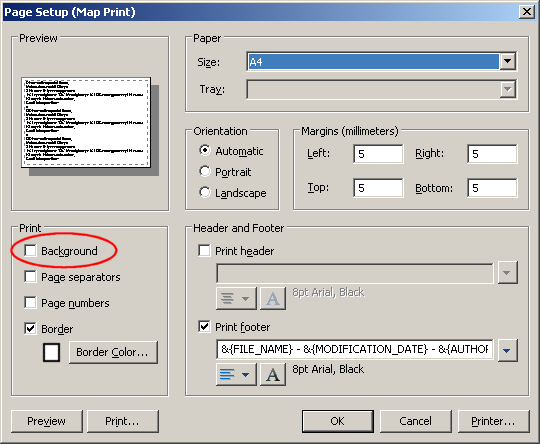 In the Page Setup menu, always ensure that the "Print Background" option is switched off! The reason is that the mind map has an off-white background colour defined for it. This makes it easier to read on the screen, but if you attempt to print the fully expanded mind map, it will generate a print job of around 475Mb (depending on the type of printer being used). Not surprisingly, a print job this size caused the above printer to abort the job. The answer is simply to switch off the background colour during printing, and the size of the print job drops to just over 2Mb! Figure 5: If you wish to print the fully expanded mind map, then ensure that the Background colour is not printed. You can also open/convert the Mindjet Mindmap files using XMind(www.xmind.net), which is an open-source Freeware, and then you can extend this mindmap on your own. Freemind ( freemind .softonic.de/) also imports Mindjet Files.